Travel insurance. Don’t leave home without it! TET or Lunar New Year occurs at the end of January in 2017. The lead up to the Year of the Rooster will be very festive, but during the actual holiday period, the atmosphere around the country will change completely. The usually chaotic city of Saigon turns super quiet as people travel back to their hometown and enjoy a quiet time with close family and friends. TET is the most important time of the year for locals. Think of it as the equivalent of the Christmas – New Year period in the West. However, as a visitor, if you’re not prepared, visiting Ho Chi Minh City during TET might turn out to be a huge disappointment. Alternatively, you won’t want to miss out on some of the highlights you can only see and do at this time. Editors Note: Check out some of the pictures we took in the build up to festivities for TET 2015 HERE. A picture of elegance. Lucky New Years photos. Most public offices are closed on those days, and it will be impossible to get administrative tasks done. You need to leave plenty of time to arrange your VISA approval letters, even if you aren’t visiting til just after! Most businesses around town, close or operate on reduced hours at some point over this period. That includes street food vendors and souvenir sellers. Where we live in the inner suburbs, it was almost impossible to buy even a Banh Mi (Baguette) for three or four days last year. Luckily for tourists, most hotels and major tourist sites remain open (although I’ll double check closer to the time). Do not leave your VISA ARRANGEMENTS too late; OR expect to get a visa extension just before, during or after TET. I know of more than one person who got into a sticky situation because they didn’t realise that VISA services also go on holidays at this time of year. Everyone is going somewhere during TET. There are many additional flights, buses and trains leading into and out of the holiday, but they will be packed. Book early to secure a place and expect line ups at check in, so don’t leave things to the last minute. During the main holidays, some bus services may stop altogether. Check beforehand, so you don’t get stranded. A new service makes it easy to look at your transport options, the different prices, and book online. 12GoAsia . It’s a one-stop shop for planes, trains, buses, and boats and takes the guesswork out of what your should pay. 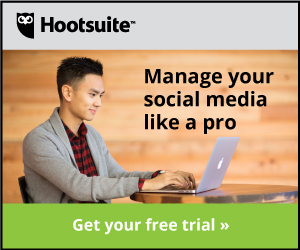 Even if you just look at your options here, you can then evaluate what you’re being told on the ground to know if you’re getting a good deal. Find out moreHERE. Plan your activities well ahead. If you are visiting during the TET holiday period and plan to do any TOURS, inquire if they are running during the holiday and book well ahead, so you don’t miss out. Some companies, for example, street food tours, won’t operate as there will be very few street food vendors around. However, you might still be able to fo on their general tours. It’s the peak tourist season in January and February, so if tours are running, they will fill up fast. Some companies, like the cooking schools, may only close for a day or two, but it’s best to know ahead of time so you can plan your itinerary in advance. Have plenty of cash available for the holiday period. Banks close and many ATM’s run out of money by the end of the closure. Number 5 – What’s on? Vietnam Online – more of a local perspective. HCMC Anglo Info – a good all round site focused mainly on expats but also useful for short-term visitors. When I’ve checked on the big attractions around town such as the War Remnants Museum and Reunification Palace in previous years they’ve told me they open every day. Different sources say otherwise. I’ll check closer to the time and update this section if I find out they shut and when. Theme parks, DamSen (right click and translate the Vietnamese to English for details) and Suoi Ten are very popular with the locals during the holidays and usually, have special TET activities and displays. A visit to either is an excellent way to enjoy the holiday spirit. Number 7 – Will you starve to death??? Many smaller local restaurants close as people return to their hometowns.You won’t starve, though. There are at least some restaurants and cafes in the main tourist areas like Pham Ngu Lao, Bui Vien and other parts of District 1 that remain open. Things get a little crazier at this time of year. Take Care! Just before TET, the incidence of bag snatching and soft muggings tends to go up. Make sure you read and follow my tips for staying safe in HCMC and be extra vigilant. Scrutiny on the part of public officials such as police also increases at this time of year. It goes without saying that you should obey all laws, and carry the correct paperwork such as drivers licenses. Much the same as the Xmas rush in our home countries, traffic and crowds become even more frantic in the city than usual. You should always take care on the roads here and have appropriate travel insurance, but it’s even more important at this time of year. Thankfully, it calms down as soon as the official holiday period starts. Walking around the city during the day and evening is such a different experience over TET. The traffic is quiet, and the main streets and shopping centres are lit up with beautiful lights and decorations. 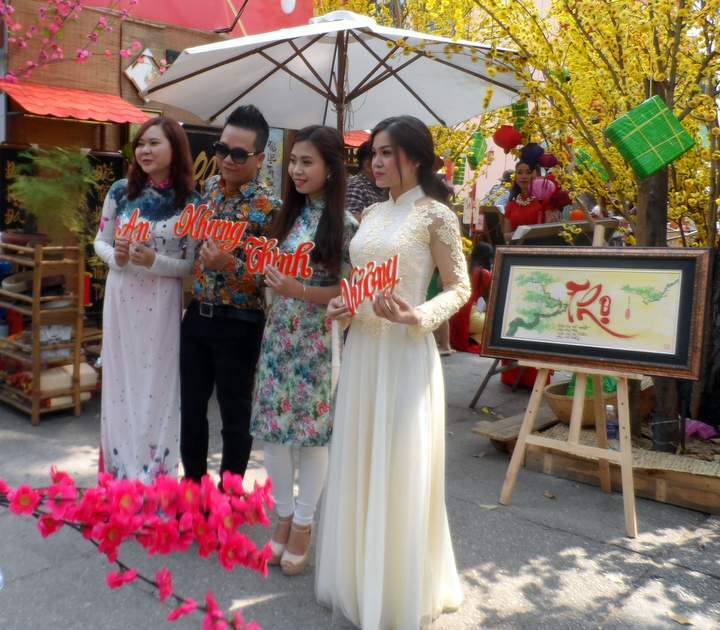 Just before the holidays, locals dress up in traditional Ao Dai and have their lucky New Years photos taken. They usually don’t mind if you take a few snaps too. Places like the front of Diamond Plaza and a block or two north are usually humming. Just follow the colours, and you’ll be sure to get a few nice pics. Ride around the city on a XeOm (motorbike taxi) by night or join one of the night tours. Once again, the traffic will be far less chaotic, but many of the lights and sights will be even more beautiful than usual. Cho Lon (China Town) is especially colourful this time of year. If you are are a bit of a scaredy cat concerning the motorbike rides, grab a cab and get them to drive around the main areas. Le Duan, the road leading up to Reunification Palace and past Diamond Plaza is especially lovely, and you’ll get a similar but less exhilarating experience. Make sure you watch your cameras if you’re hanging them out to take pictures and make sure you follow my tips for avoiding taxi scams. Many of the big hotels around town like will have special (and quite lavish) buffet dinners on New Year’s Eve (27th January). There may even be door shows and performances.But once again, these will fill up fast so book in advance. Take time out to visit Cholon (District 5), the Chinese part of town. Temples are covered in decorations, and you will learn much about Vietnamese traditions. Speciality shops in this area are a riot of colour selling TET decorations. 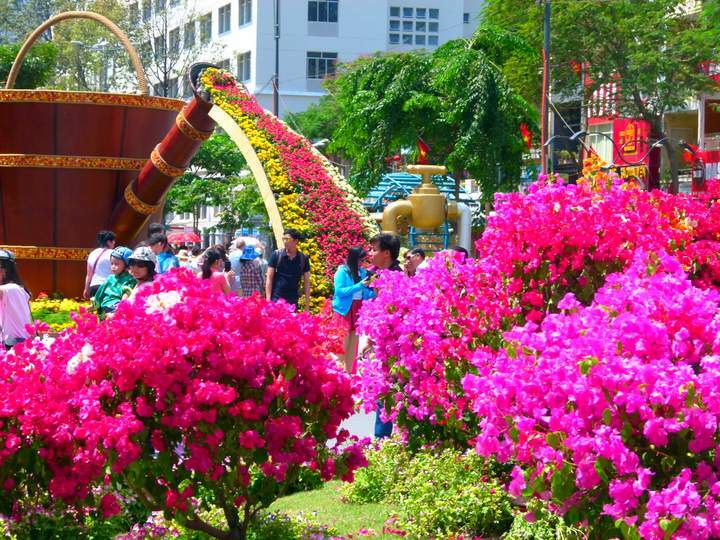 Make sure you visit the Flower Street in Nguyen Hue (Walking Street). It kicks off on the 25th January in 2017 and will run through to the end of the holiday period. (final day 31st January) The displays are always exceptional. A fantastic array of blooms in Flower Street to celebrate Lunar New Year. New Year’s Eve means spectacular fireworks around the city. Try and get to a good vantage point like a sky bar to watch them but be aware that the crowds are enormous and it will take a long time to get home afterwards. So should you Visit Saigon during TET 2017? Most of us that live here tend to take the opportunity to head abroad or to one of the traditional holiday areas like Nha Trang or Phu Quoc. BUT….This year we are staying. It’s been a huge year for both of us and we’ll be glad of the peace and quiet. We know what goes on and we’ll be well prepared. So, if you’ve booked your holiday don’t despair. It’s not like there won’t be anything to do. You just won’t experience any of the usual chaos. For many of you, that might be a positive thing, especially if you’re not so fond of big, busy cities. 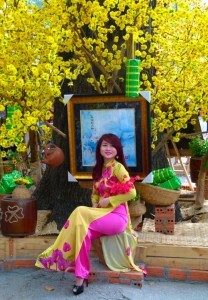 TET is a very special time of year for Vietnamese people, and everyone is usually in good spirits. 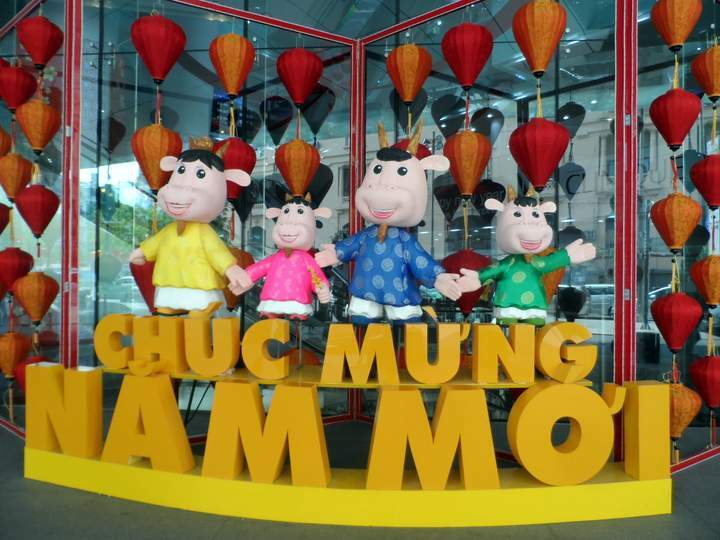 Learn to say Happy New Year in Vietnamese (Chook Moong Nam Moy!) and use it liberally. The response you’ll get from the locals will be very special – buckets of smiles and good humour. There are still some activities to do, and you will experience many traditional customs you can’t at other times during the year. So join in with the spirit, learn as much as you can, and have a fabulous time when visiting Saigon during TET in 2017. I’ll see you again in the Year of the Rooster. According to some predictions, it’s going to bring fresh challenges requiring quick wit and practical solutions, so you’d better rest up! Note: I do not receive any payment for this post (or any others on the site for that matter!). I do receive a small amount of money by allowing advertisements on the site and any purchases made through those links. Next story Bonsai Saigon River Cruise – Resurrection! 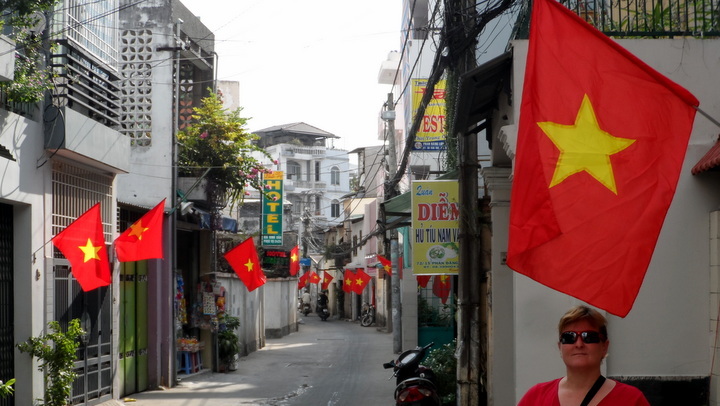 Thank you for all of the great insight into staying in Saigon over Tet. I will be arriving Feb 15 2108 to Ho Chi Minh airport, this was not intended to land the day of Tet, but I am a bit nervous/excited that this experience will greet me when I land. I would like to stay close to Hguyen Hue flower street. I am wondering if there are any parades or fireworks or both that are scheduled for that celebration? I am wondering if I can find a hotel with a balcony and if I am overwhelmed by the amount of people, I can still sit on my balcony and watch the street party from a good vantage point? Do you have any suggestions? First of all, sorry for the delay in my reply. I’ve been in transit on a trip back to Australia. It depends on your budget as to where I recommend staying. To the west of flower street and Ben Thanh Market is the budget area, to the East is more upmarket. there is plenty of opportunities to wander in flower street without the crowds, earlier in the morning etc. And several bars/cafes that overlook the street. The Rex is wonderful for sunset, and Broma not a Bar also overlooks it. Here is a link to my finding a cheap hotel page. The process works just as well for mid-range and high-end hotels. http://hochiminhcityhighlights.com/finding-cheap-hotel-ho-chi-minh-city If you use the Agoda and booking.com links, search for hotels in your budget in District 1, Ho Chi Minh City. Then choose “map view” Walking street “Nguyen Hue” is right in the middle of that area. The Rex, The Palace, The Reverie, and the Royal are just a few I found along the street. My husband and I are planning to spend 3 months in Vietnam arriving February 1. 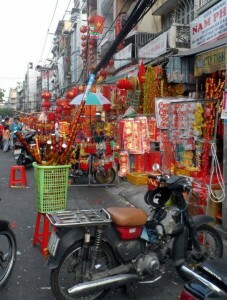 The TET information was very helpful and we think we will explore HCMC when we 1st get there then head out before Tet . Our plan is to start in the south and slowly make our way north to Hanoi. Do you have any suggestions for sites to book longer term rentals.? Would 2 weeks in HCMC be too long? Thanks, great site. It really depends on what you’re interested in. There’s so much to do and see in HCMC apart from just the usual tourist attractions. Do you do tours or are you more likely to get around and explore independently? There’s plenty to do in and around HCMC like an extended Mekong tour. I would go for at least 3 to 4 days to get a real insight. What’s your budget for accommodation? I have a few recommendations on my accommodation page in various price brackets. http://hochiminhcityhighlights.com/ho-chi-minh-city-highlights They’re the ones we’ve actually used personally but there are thousands to choose from. Airbnb is becoming huge here now and I’d probably do something like that for a longer stay. If you’re not already a member use this coupon to get up to $25 USD off your first booking. http://www.airbnb.com/c/tnilsen6 Get back to me with any specific questions you might have and I’ll try and help out. Hi Sharyn, So glad i came across your website. It will be my first time in HCMC and am wondering where’s a good centralised place to stay or sightsee/shop esp massage and experience the famous hair wash experience ;P (PS: I’m very much into history/war and all that stuff) I will be arriving during TET and would like to absorb much of HCMC as much as I can in just one full day. (yes a very short stop over) Also are most of the area easily reached by foot or is there a public transport I should take (motorbike?) Thank you so very much in advance! Chuck Mung Nam Moi!! At the outset thank you for providing such a fascinating insight on Ho Chi Minh in general and the ‘Tet Conundrum’ in particular! my friend and I would be travelling on the 27th and remain in Ho Chi Minh till the 30th evening. At the time of booking our tickets we were absolutely clueless about the ensuing TET festival. Now even though our collective fears have been allayed a bit (thanks to your website) we are still a bit apprehensive about missing out on a couple of attractions. We would be extremely grateful to you if you can let us know as to whether the War Remnants Museum and the Cu Chi Tunnels will be open during the TET festival. once again appreciate the fantastic work done by you and keep it going! As far as I’m aware the war remnants museum will be open. This is the link to their opening hours. http://warremnantsmuseum.com/posts/opening-hours. I also believe Cu Chi will be open as friends took tours there during TET last year. I have emailed them to confirm but as yet have no response. I can’t give you a 100% guarantee, however, as thing do change…But I’m pretty sure these attractions should be open at least one day on your visit.The other two museums that might also be open are the City Museum (http://www.hcmc-museum.edu.vn/en-us/home-page.aspx) and the HCM Museum (http://www.baotanghochiminh.vn/en/TabId/562/ArticleId/7126/PreTabId/528/Default.aspx). My partner and I are currently travelling through Vietnam. We have just arrived in Hoi An and have a possible 2/3 weeks travelling south from here before heading into Cambodia. This means we will be here for Tet and was wondering if you have any recommendations as to where might be the best option for us as tourists to stay in the south of Vietnam for this period. (If not Ho Chi Minh) We are fairly flexible with time but we sort of estimated that we are likely to be Ho Chi Minh area. But was curious for any other suggestions. Up until now we have just gone with the flow of things and not booked anywhere ahead but Is it wise in this instance for us to book up our transport now and do a little planning? Do you know if the free tour companies and students are likely to do tours during any of this period or is it just urban adventures? Lastly and sorry for the long msg but your post was very helpful. if we are in Ho Chi Minh over this time what is the likely hood of us being able to travel out , for example a trip to the Mekong delta area or a couple of days at phu quoc? I would head to somewhere like Mui Ne or Phu Quoc, at least for the main three days around New Year – 26th/27th/28th. We spent Tet 2015 in Phu Quoc and most things were open. Flights are pretty cheap even for that busy time of year (~40 USD each way from HCMC) As far as transport goes, it’s hit or miss. Those buses that are running will probably be very full. I remember trying to get a bus back from Kampot across the southern border to Vietnam during TET 2012 and those buses had stopped completely. Your best bet for information is the tourist agencies in Bui Vien in D1. I don’t think any of the free tours will be operating as the students will all go home to their home villages for TET. I know that places like Cu Chi tunnels were still open in years gone past. If they’re open you should be able to get a cheap tour in Bui Vien and maybe to the Mekong. Note that Urban Adventures closes for 1 week as well according tot their latest booking availability.You could still do my free self-guided walking tours and don’t miss flower street. Some of the expat haunts will still be open. Check out the info links for Word magazine, any arena etc. in the post for details. Hope this helps. As I said. There are still things to do here, but you definitely won’t see the real Saigon over that period. Hi Sharyn we arrive 27th January to HCMC so many thanks for all this info it really helps. We are coming from Portugal (I am British and my partner Portuguese) starting to check visa online applications now so need any advice on trusted websites if you have it. Believe we get a document to hand in at airport for visa? The guys I recommend on this page are very reliable http://hochiminhcityhighlights.com/vietnam-tourist-visa-requirements. Note my hints on a smooth passage through the process at the end of the post. There are links to the form you need as well. My sister came in yesterday from Australia and she had her visa in less than 20 minutes smooth sailing. Have a great trip. Yes, definitely head to flower street if you can get transport from the ship. What is the exact day you’ll be here? Just because one tour company isn’t operating, doesn’t mean they all won’t be. Try these guys. http://hochiminhcityhighlights.com/urban-adventures. They’re part of the international Intrepid travel group so may not be quite so influenced by the local holiday. Don’t bother trying to book a food tour though. Most of the restaurants and street food vendors will be on holidays so they probably won’t be doing that one. The war remnants museum website says they are open every day, including holidays. It’s well worth going to if you want to get a sense of recent Vietnamese history. Walk back down Don Khoi street to the centre. Not everything will be open BUT you will still be able to admire the parks, architecture etc. This article might help. You can download the app to help with directions. Everything described is free except for a few entry fees. The larger hotels will be open – Sheraton, The Reverie, Park Royal. etc. some of them have roof bars so you can catch some views while enjoying lunch or a drink. As we are arriving in Ho Chi Minh on 28-1-17, your blog was very useful. So happy to hear that. The most important thing is to get your visas sorted earlier rather than later. (If you need one that is) It will be very quiet when you get here but will start to liven up as the week goes on. How long will you be here? The easiest way to get your visa. Bonsai Saigon River Cruise – Resurrection! Urban Adventure – for your best day ever! 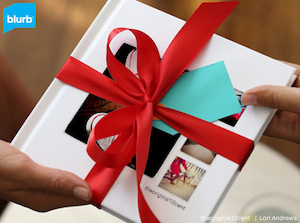 Turn your holiday pics into a book.